The regular school year originally was designed to be for nine months and in the summer the boys would help their dads in the fields. Since modern society doesn’t have as many farmers, what is the point of this old and overused system? I think the balanced year would be an advantage for Pittsford and all other Hillsdale county schools. Think about it! During the summer students lose most of what they have learned due to sleeping in and the internet, so why not reduce that to a minimum by having school all year round. Of course, they would have some breaks in-between. With the system the students would not miss any school nor would they gain any vacation days. The same 180 days would stay in place. The amount of vacation days is 78 which is equivalent to the three months the students would have off for summer. The only difference is that they would be spread out over time. 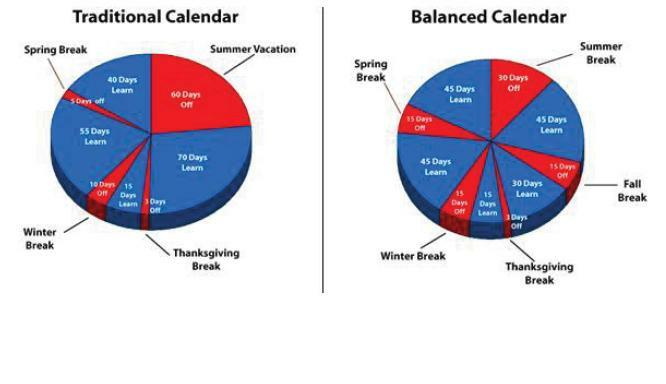 The students would have a summer break (30 days), a fall break (15 days), a thanksgiving break (3 days), a winter break (15 days), and a spring break (15 days). The school days would be split into chunks of 45 with some exceptions of 30 and a 15. Sophomore Kiara Thomas said she would like the breaks. “I think the breaks are good because they would give me more time to study and understand the things that I’m doing,” she said. A small survey of juniors and seniors gave the following results: 20 votes in favor of the traditional calendar, which we are on now, and 22 votes in favor of a balanced calendar. As you can see the opinions are quite split. A breakdown of the individual votes would have shown the juniors seem to think that a balanced school year is a good idea; however, the sophomore class seems to want everything to stay the same. Why? Junior Shane Miller, a PHS student, thinks the balanced year is the way to go. “You’re taking a three month break to where you forget stuff, but when you take two weeks there and two weeks here off they won’t forget the stuff they’re learning in school,” he says. A very good point! Most students lose a full two months of education over the summer months. This means more time wasted on review during the first few days (maybe even up to a month) of the traditional school year. Wouldn’t that technically mean you are losing days to relearn what you have already learned? Pittsford dean of students Mrs. Mallar even supports the idea. She agreed that learning this way would be more beneficial to the students. “I would be all-in for changing to a balanced schedule; definitely, I would! I think it would be good because you’d have shorter chunks of information and then you’d get a small break, and then you’d get another chunk of information and you get a small break which is better for learning I think. It would also be good because you’d be able to take vacations during times when it would be cheaper and isn’t as busy because it’s not a regular vacation time. So that would be good,” she stated. If our dean of students is for it why haven’t we changed? If you ask me I will most likely question why we haven’t switched already! Since the traditional school year’s summer vacation isn’t essential some experts are questioning if it’s even beneficial to kids these days. Several countries around the world are far more advanced than us. Ever wondered why? Their kids go to school on average a full 250 days a year. So why are we still stuck 100 years in the past? Come on Pittsford! Get with the other schools who have progressed to this schedule! Have you ever gone back to school in September and the weather hasn’t quite changed from the summer months? Imagine going to school all the way through June with time off in July and then back again in August! At a school like Pittsford you may find yourself unable to focus because of how hot it is due to a lack of cooling system. Because of reasons like this, it would be unwise for Pittsford to consider changing from a traditional to a more “balanced” schedule. “It could cost the school more money because during the summer months we would not make it without air conditioning,” opined Pittsford junior Taylor Langston. This is merely one problem many schools (not just Pittsford) would face if the transition was made to go to a balanced calendar. Most schools, including Pittsford, follow a traditional school calendar. A traditional school calendar typically spans the course of nine months. The school year usually begins anywhere from the middle of August to the first of September and continues to the middle of May to the first of June. Students and teachers get the remainder of the summer off. Many states require their schools to be in session from 175-180 days. A traditional calendar provides time for students to find a summer job. This off-time provides opportunity to earn money for any reason a student might find. “In my job there is no work after school. Without the summer I wouldn’t have a job, then I don’t get paid and I’ll have no money,” explained Langston. School is supposed to help prepare you for a job, however, if you are left with no time to actually get one, then what use is that? Having a balanced calendar would call for many sporting events to be scheduled during the times students are not in school. Usually if a game is played on a day when there is no school, less people tend to make an appearance at the game. This decreases profit from the entry fee and decreases profit on concessions. Money is spent to prepare food for concessions, but if there is no one to buy, then the money is wasted. Think about what fewer students and fans cheering them on would do to the morale of the players. “The players won’t have the same support throughout the week to help them prepare for the game because they’re not surrounded by other students,” said PHS sophomore athlete Alex Price. In a more personal sense, Price adds, “I think spreading out the breaks would make me not study more often. It (the balanced calendar) takes away from the summer months that people look forward to. The traditional is what students are used to dealing with and it wouldn’t work if we all of a sudden made this change.” Aside from the mentality and habits of the students, Alex thinks that the costs to make such a transition possible would be better spent elsewhere. “We should be focusing our money to help the school; such as new electrical systems,” explained Price. The debate between a traditional calendar and a balanced calendar is still very relevant and can get heated from time to time. Teachers seem to adjust better; however, parents are having a harder time. Parents have gone to the extreme of keeping their children home until after Labor Day to protest this transition. No matter what reports say, the pros and cons of each calendar vary for every single student. This is why the argument remains; what is beneficial for one student may not be so helpful for the next.